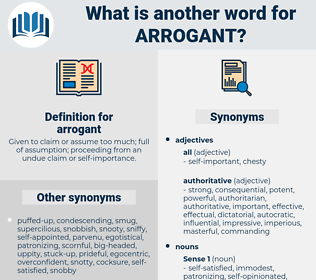 What is another word for arrogant? Given to claim or assume too much; full of assumption; proceeding from an undue claim or self- importance. 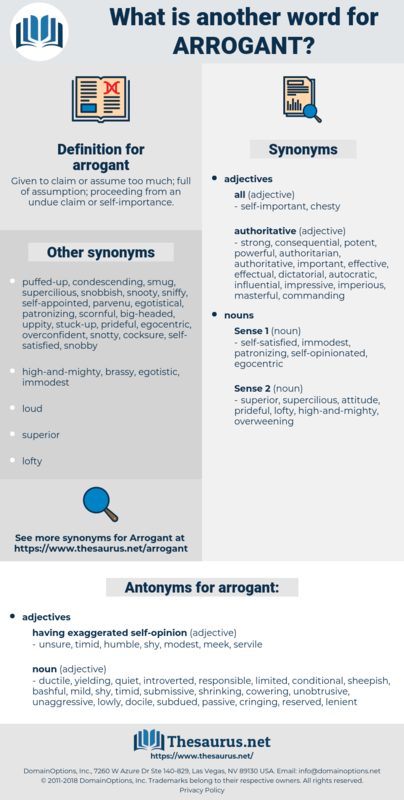 unsure, timid, humble, shy, modest, meek, servile. responsible, unaggressive, acquiescent, overmodest, constitutional, ductile, deferential, sheepish, complaisant, compliant, subdued, docile, gentle, lowly, accountable, limited, bashful, reserved, mild, cringing, quiet, introverted, mousy, diffident, yielding, unobtrusive, cowering, shrinking, unassertive, passive, retiring, conditional, lenient, submissive, contingent. By this amendment we strike down the iniquity of one class wielding political power for another, and arrogant because in the exercise of unjust power. His wife appears to have been arrogant and imperious; his step - son the Earl was a rake and unfriendly to him; while in his public capacity his invincible shyness made him of little use in Parliament. arc cosecant, arachnida, argonauta, arc secant, argument, arrowsmith, argonautidae, argentite, arcminute, aragonite, arcsecond, argent, arccosecant, arcsecant, arsenide, areca nut, arachnoid, archegoniate, arsenate, arachnid, argonaut, arraignment.